It’s back to school time and it kind of makes me miss being in school. In elementary school, I used to get a new backpack each year. I meticulously searching all of my options at K-Mart, opening all of the zippers and pouches, and wearing the pack as I walked back and forth in the aisle. I tended to gravitate towards the largest backpacks with the most compartments. I have an old picture of my kindergarten self on the first day of school wearing a backpack that is actually larger than me. Like, how could a kindergartener possibly have THAT much to bring to school?? I’m sure I had my entire stuffed animal collection in there or something. When I wasn’t looking at backpacks, I was working my way through the “back-to-school” supplies aisles. You know that You’ve Got Mail quote about wanting to send a bouquet of freshly sharpened pencils because the Fall made him want to buy school supplies? I feel like that is something that I would do. To this day, I still love looking at all of the supplies when I go to Target. I look at all the different types and colors of notebooks, check out the binders and their various sizes, look at the latest trends of folder designs, all the while imagining how I would store all of my new supplies in my sick backpack. The “fun” factor of back to school slowly evolved as I required less arts and crafts supplies, but rather prepared for the school year in different ways. Junior high and high school was when we got to make book covers for all of our textbooks at the start of the year, and of course I decorated mine super cool (which actually probably wasn’t, lol). I remember one year I decorated one of the books with a bunch of cut-outs of historical black and white photographs from National Geographic. One of the photos was taken in the 1930’s and had a group of skyscraper construction workers sitting on an I-beam suspended hundreds of feet in the air. Every time I looked at it, I imagined myself in their shoes, and the height terrified me! And yet, I kept that photo on my textbook all year... lol. Back to school time also corresponds to nearing the end of peach season. But before that season passed, I squeezed in this Peach Raspberry Galette. A galette, or crostata, is a freeform pastry, or as I like to describe it, it is a flat pie. They are easy to make, and have a beautiful presentation. Making the dough can be the difficult component to the recipe, but if you have a food processor, it is significantly easier. If you don’t though, don’t worry, I don’t either (because girl doesn’t have any more space in her tiny kitchen) and I was still able to make it by hand without issues. After rolling out the dough into a large circle, you will top the middle with the fruit, fold up the sides, and then toss it in the oven. And that's it! 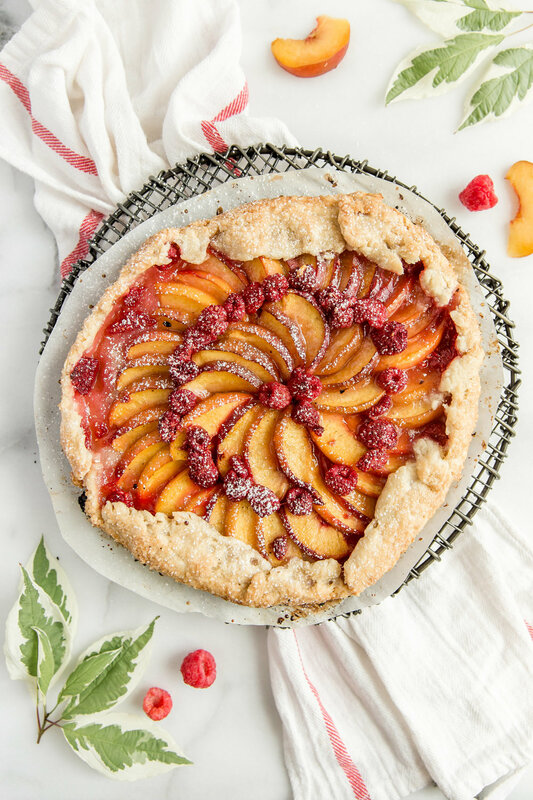 The galette crust is flaky, while the inside is filled with sweetness from ripe peaches and raspberries. To balance out some of the sweetness, the fruit is tossed in a dash of cardamom, which adds a level of richness and depth to the dessert. This summer dessert pairs perfectly with vanilla ice cream, or you can keep it simple with a dusting of powdered sugar! Sift together the flour and salt into a medium bowl. Using a pastry blender, cut in the butter until the mixture resembles coarse, pea-sized crumbs. Add the ice cold water until the dough sticks together when squeezed together with your fingers. The dough will look shaggy at this point. Turn the dough out onto a lightly floured surface. Work the dough into a ball, then flatten into a thick disk. Roll the dough into a 12" circle on a lightly floured surface. Transfer to the prepared baking sheet. For the filling, place the peach slices and raspberries in a large bowl. Add the sugar, cornstarch, lemon juice, and cardamon. Gently toss the fruit until well coated. Arrange the fruit on the dough, leaving a 1 1/2" border. Gently fold the border over the fruit, pinching the dough together. Brush the dough with cream, and sprinkle with turbinado sugar. Bake for 50-60 minutes, until the edges are golden and the filling is bubbling slightly. (Optional) Serve with vanilla ice cream. You can make the dough with a food processor instead if you prefer. Pulse the flour and salt together briefly. Add the butter and pulse until it resembles coarse, pea-sized crumbs. With the processor running, add the ice cold water until it all comes together. Resume the original recipe at step #3.